I stole a frame from our hive Mars recently. While I wasn’t exactly sure how much honey one medium Lang frame would produce, I was ready to find out. Also, I really wanted to try the two-bucket straining system I bought from Brushy Mountain earlier this year. You may recall that I bottled a single jar of honey in the spring. That was a very clear spring honey, tasty and not too sweet. It was good, though I was hoping the summer honey would be a little sweeter. I’d read that honey tends to get darker as the season goes on. I froze the frame overnight, which is recommended (though perhaps not required if the honey is extracted right away). Our freezer just barely fits a single medium frame in exactly one spot, so I definitely need to get some sort of chest freezer that can handle multiple frames. Just have to convince my darling wife…. My serrated knife from checking top bar hives worked well as an uncapper (well washed, of course). A bucket of near boiling water and the hot knife cut through the comb like butter. At first I was hoping to drain the honey directly and save some of the comb. The picture here is me in the kitchen waiting for something to happen. 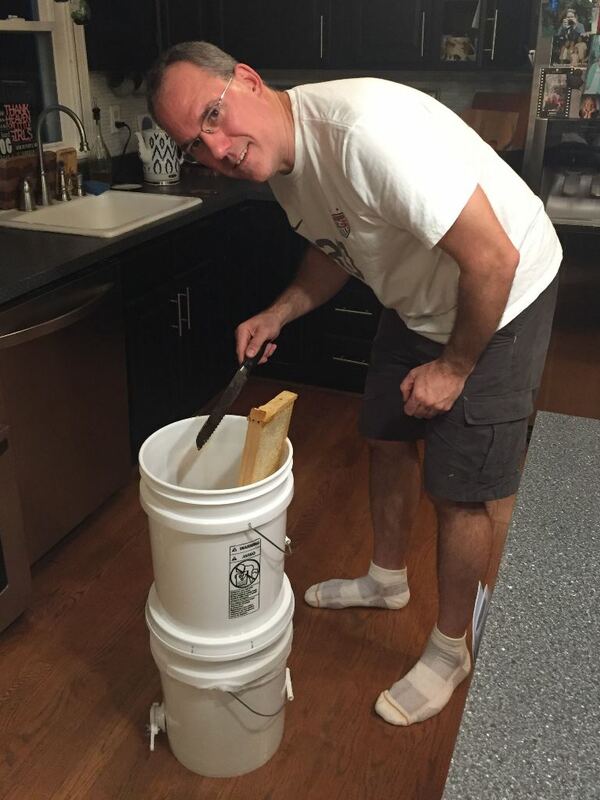 The honey was not nearly warm enough to drip, so I cut it all off and into the top bucket. The result looked something like this, which I mashed up and left to drain overnight. In the morning I found about an inch and a half or so of honey (around 3.5 cm) in the bottom bucket. 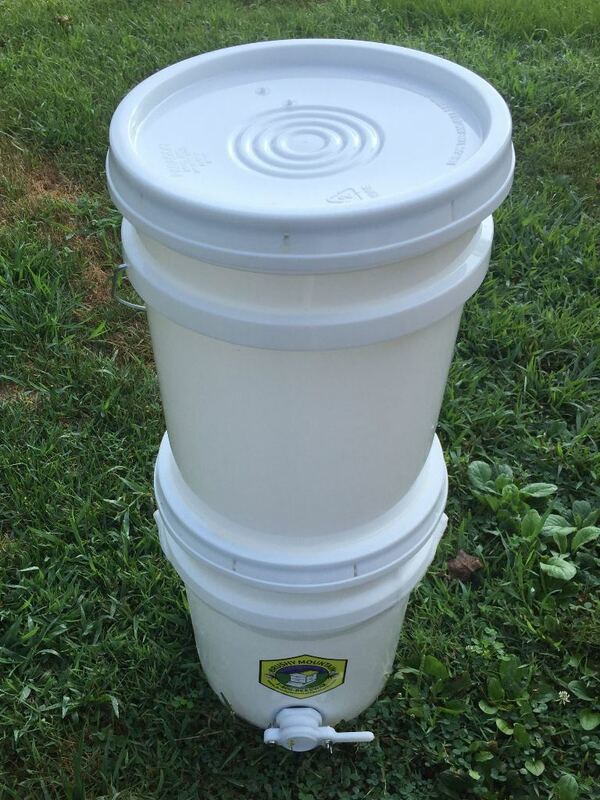 It may not be much, but exciting for a new beekeeper. 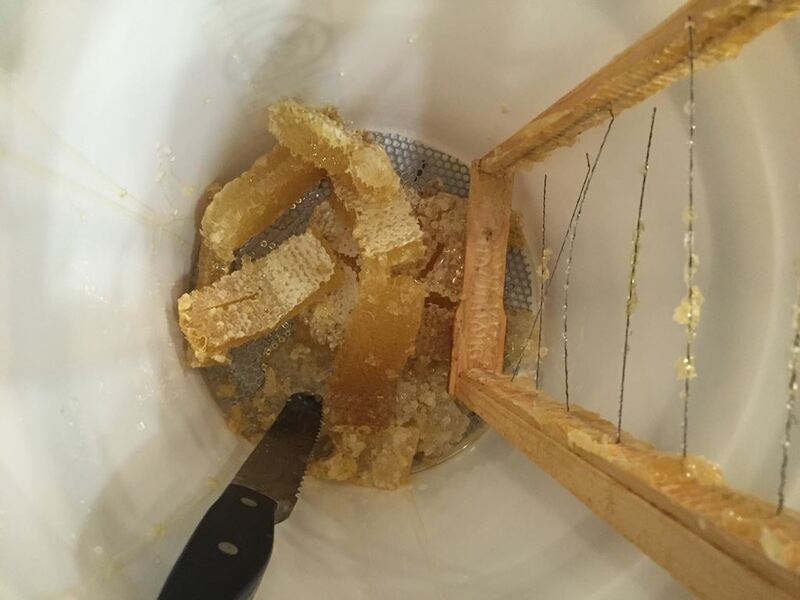 I wasn’t sure how to use the honey gate, and was worried it might leak or otherwise cause a mess. My family helped, and we moved the bucket outside where it was both warmer and more forgiving of spills. The picture here is my daughter trying it out. 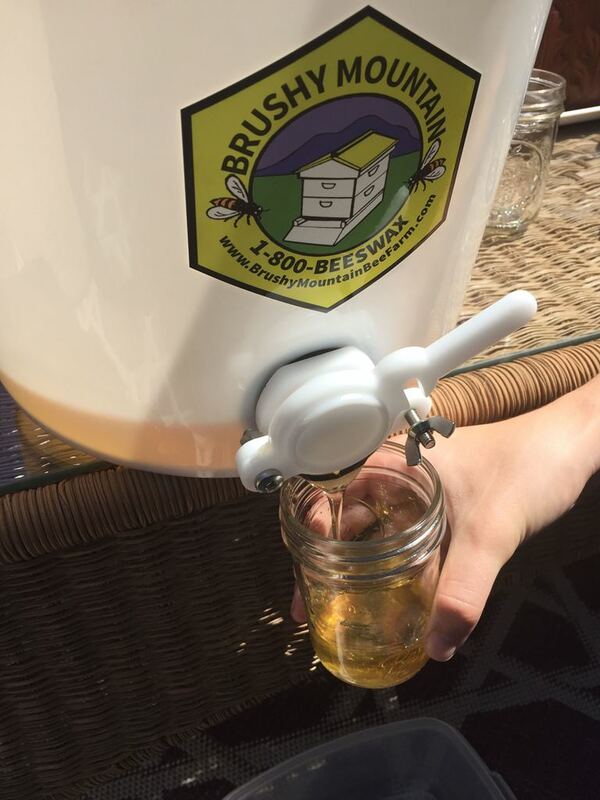 At the end of the day, we managed to bottle four and a half jars of honey. It was a bit darker than my spring honey, and definitely sweeter. So good. These will be gifts for neighbors and family. The raw comb was so good; I was happy to lick the spoon. 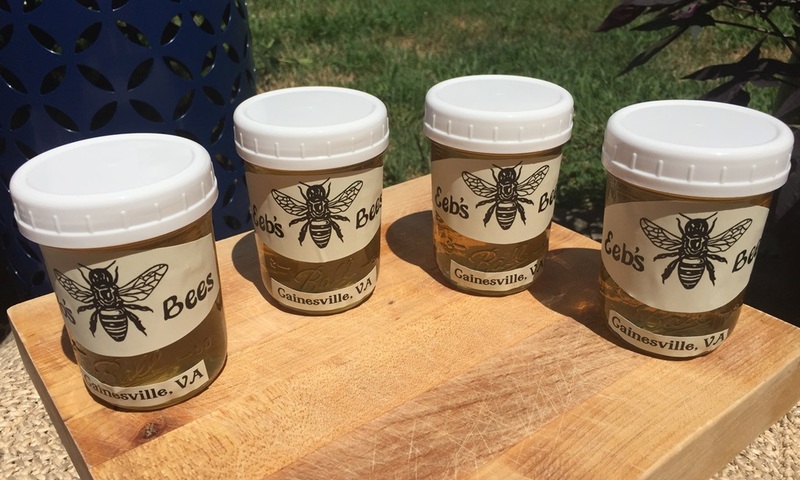 I’m waiting until fall to consider taking some additional honey, as I want to make sure the bees have enough food for the winter. This should last us until them. This quote comes from one of my favorite beekeeping shirts; my parents picked it up at the Savannah Bee Company while they were in Georgia last year. The shirts has this phrase on the front and the company logo on the back, and is available at this link if you are so inclined. Some sites attribute the honey version to Winnie the Pooh, though I couldn’t find any support for this notion. There are towels, plaques, and other paraphenalia on Etsy.com with the quote. I definitely had my mind on my honey this week. Yummy! Hurray! Congrats on your delicious looking honey. Congratulations! Nothing is sweeter than the first harvest! Thanks. The difference in color and taste is interesting from spring to summer. I’m curious now to see what fall honey would look like, if I can swing it.